Do as I say, AND as I do! She had a few medical recommendations for me, as well. In addition to taking a good multivitamin, she said to make sure I am getting B12, folate, iron, and calcium. I should get my iron levels screened and have a DEXA-scan (bone density test) to make sure I don't have osteopenia or osteoporosis. Yikes! Since it has only been about a month into my gluten free diet she said I should not worry about my weight. I was advised to increase my caloric , protein, and (good) fat intake. More nuts. Slightly larger portion sizes. If near the end of January (after all the crazy holiday eating) I have not gained weight or (worse) lost more weight, I need to get my thyroid checked. Apparently, hyperthyroid can be triggered by, or connected to, other autoimmune disorders. Joy. We are going to work on the assumption that I have just been eating healthy and therefore have simply maintained my current weight. (I know, I know, shut up you skinny twit.) So yeah, eat more good food. She was happy to see I had started a food log. I think this put us way ahead in this process. Actually, she said that in the six years she has been counseling individuals with Celiac, I have the most varied and healthy diet she has seen. I give props to all of you for this. You have given me so many ideas and a wealth of inspiration. Thank you to all of you for you support and excellent recipes! One of the coolest things I got out of my appointment was the care package. 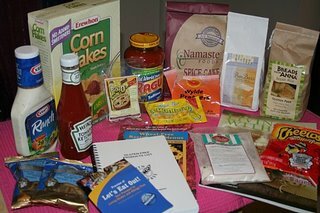 U of C puts together a care package for the newly diagnosed. It is great. My fav from it so far is the Ener G pretzels. YUM! These suckers are great. At least as good as "normal" pretzels. Now I want to make Pretzel Jello with these crispy, crunchie jewels. I can't wait to try the Namaste Spice Cake, Bread from Anna, and one other baking mix I had never heard of. Here, take a peek! Some of the items are questionable (Kraft dressing), but the rest will be used. Oh yes, free GF food stuff will always be used. I can't like it! Oh wait...maybe I can. I have always considered myself to be an open-minded person when it comes to food. There is very little that I shy away from. I tend to have a policy of "you have to try it before you diss it". I mean, imagine all that you might miss out on if you refused to try something simply based in the look of it! That being said, I have recently come to a realization. While perusing my cookbooks and the countless food blogs I am now addicted to, I have noticed how many ingredients I have never used in my culinary adventures. That is not to say I have never eaten them, but cooked with them? Nope. Some of the long neglected ingredients are butternut squash, pumpkin, quince, lamb, quinoa, fresh cranberries, and brussel sprouts (to n ame a few.) I have already started to rectify these oversights. I have discovered a love affair with quinoa. My cranberries were a raging success at Thanksgiving. 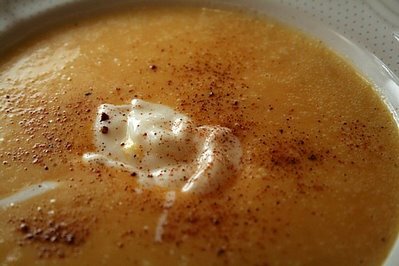 Pumpkin was a fantastic addition to my soup. But brussel sprouts? Ew! This is how I usually look upon the mention of those little green bastards. I mean really, how can anyone enjoy a vegetable that looks like the heads of the aliens from the movie "Mars Attacks"? I'm a big kid now. (Go ahead, sing the jiggle. You know you want to.) I figured I should take a page out of Mikey's book and try them again, I might like it. So I braced myself, purchased a bun ch of really nice looking sprouts, and prepared to cook. Now I wouldn't just get the idea to cook brussel sprouts from out of the clear blue sky. Salmon, yes. 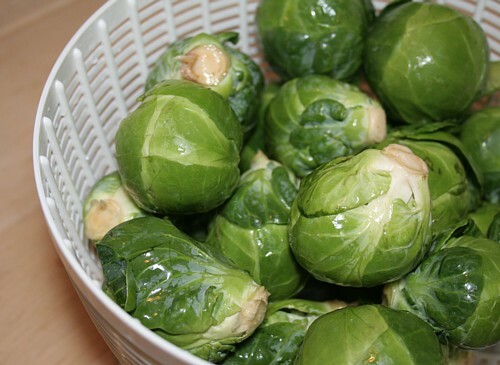 Brussel sprouts, no. I was browsing through entries on Erielle's blog, Fancy Toast, and saw this lovely recipe that calls for braising. I have never done this. Why not kill two birds with one stone? Also...I had nearly all the ingredients. Nearly. I had to make a last minute substitution. Once it finished cooking I piled a helping on my plate and prepared myself for the first taste. The result? Wow!!! What a fantastic surprise. So yummy! The brussel sprout has been reborn. Creamy, savory, tender. In a word: delicious. Trim the base of each sprout and peel off any ragged outer leaves.Cut the brussel sprouts through the core into half. Slice each half into either thirds or halves so that you are left with little wedges no more than 1/2" across.Over medium-high heat, melt butter in a 12" skillet that has a lid.Brown the brussel sprouts in the butter for about 5 minutes, until there are brown spots on the sprouts.Pour in the half & half and sage, stir, cover, reduce heat to a slow simmer, and cook for 30 to 35 minutes.Remove the cover, season with salt and pepper to taste, and simmer, uncovered, for a few minutes so the cream thickens and turns into a beautiful glaze. The only problem with the resolution to try new and varied ingredients is that I tend to end up with items that I am clueless how to use. For example, these beauties. 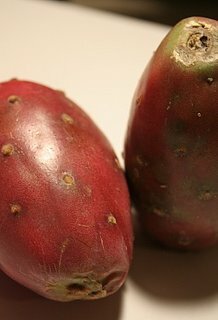 What is a girl to do with two Red Cactus Pears? Any suggestions? 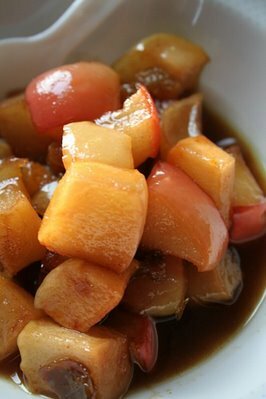 In a medium oven safe dish (Corningware) toss together the apples, cinnamon, ginger, and brown sugar. Mix in raisins. Top with pats of butter. 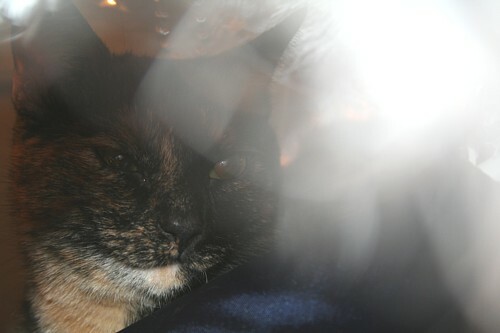 Bake uncovered at 350 degrees for 40-50 minutes. Proof the yeast by combining hot water and honey. Pour yeast into liquid and allow to sit for 5-10 minutes. The liquid will become foamy and cloudy. Combine all ingredients except raisins in a large mixing bowl. Beat together for 3 minutes with a heavy duty mixer. 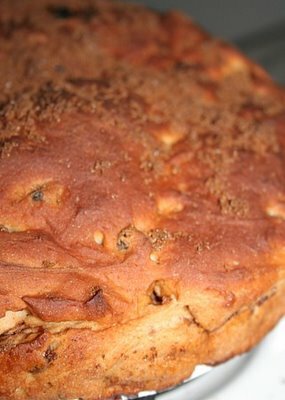 Fold raisins into the dough with a spatula. Scrape dough into a deep 9 inch round pan or into two 9 inch round cake pans. Place into the oven. Heat oven to 250 degrees and immediately turn off the heat. Allow dough to raise in the warm oven for 45 minutes. Turn on oven and bake bread at 375 degrees for 30 minutes or until brown and hollow sounding when bread is tapped. What is it about the holiday season that awakens the desire to bake? I know it is not exclusively the cold weather. We are experiencing a major heat wave here in Chicago. 60 degrees! It was so warm yesterday that Gimi and I took out his motorcycle. We went downtown, strolled through the Christmas open air market, and stopped to investigate a new exhibit of an outdoo r installation piece that I will henceforth call "The Legs". Actually, it was incredibly interesting, a wonderful example that things that look the same at first glance can have subtle differences that make each piece beautifully unique. We plan to return when it snows to see how the change in environment impacts your perception of the art. But I digress. On the way home Gimi was sweet enough to indulge me and we stopped at The Spice House before returning to my house. It was warm enough outside that I was not wearing a coat despite riding on the back of a bike along Lake Shore Drive. Yet there I was buying ground ginger and choosing the right cinnamon for my baking needs. Whisk together 1/4 cup hot water and a few drops of vanilla, with three heaping t. of cocoa mix. Blend until mix is dissolved. Top with 3/4 cup of milk. Heat to desired temp (do not boil!) Garnish with whipped cream. After the hot cocoa break and some bumming around the apartment, I started my Christmas decorating. Yes, I am a crazy Christmas person. I love this holiday. It makes me warm and fuzzy. The music, the lights, the family and friends. I love it all. I am not yet finished, but have made great headway. 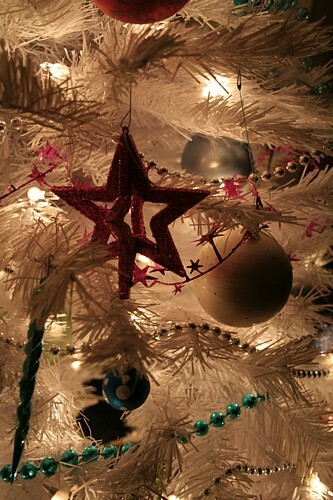 The tree is up, my wreath is made, and garland adorns the doorway. Baking is the next logical step. I need to put that new cinnamon to the test. I have a bag of Gluten Free Pantry bread mix in my cupboard. Perhaps an experiment with Cinnamon Raisin Bread is in order. This time I will need to bake it in two pans instead of one. There was an overflow issue the last time around. Oh. I added a list of my cookbooks to the blog. I am always looking for new additions. What cookbooks do you have that you can't live without? Ok, maybe it wasn't that dramatic. It was an adventure, though. My mom felt that this was the most disorganized Thanksgiving yet. Eh. It kind of was. Hey, I tried setting the dialogue going about planning our menu. Regardless, it still turned out just fine. Some dishes were more successful then others. As previously mentioned, the stuffing was not so good. The turkey itself was very nice. We forgot our Cucumber in Sour Cream dish that we always have. That is ok, we still have Christmas lurking around the corner. The Strawberry-Banana Jello is another holiday favorite. The layer of sour cream in the middle makes it a special treat. The sweet potatoes were over cooked (they were supposed to be the "candied" variety with marshmallows.) No problem! I whipped them up with a little brown sugar, vanilla, and half & half. Lightly sweet, fluffy and creamy. I think I preferred them to the original version. The biggest success (in my opinion) was the cranberry sauce. Super tangy and flavorful. We have always eaten the canned jellied stuff. I have to admit that I love it. I decided to be fancy this year. I recently purchased The America's Test Kitchen Family Cookbook. LOVE this book! Not only does it have 100's of wonderful recipes that have been tested 40-60 times before making it into their cookbooks, but it includes product reviews. Wonderful step-by-step photo illustrations for some of the techniques are included. I have not yet tried a recipe from this book or any of their other books that has failed. I combined two of the variations they included in this book for cranberry sauce, and came up with this year's dish: Orange-Ginger Cranberry Sauce. Bring sugar, water, salt, ginger and orange zest to a boil in a medium saucepan over medium heat. Stir occasionally to help dissolve the sugar. Stir in the cranberries an simmer until slightly thickened and the berries begin to pop, about 10 minutes. Cool to room temperature before serving (about one hour). Can be refrigerated in an airtight container for up to a week. I stuck with the 10 minutes of simmering. It began to thicken and pop prior to that, but I like fewer whole berries and more mush. This recipe was so simple. A great effort to flavor ratio. I am thinking of making it again and using it as a glaze for a pork roast in the slow cooker. We will have to see how that works. So did any of you try new GF holiday dishes? The smell wafting through my apartment is intoxicating. The bread itself could have used a bit more salt (I cheated and tasted the edge), but it is bread in all its squishy goodness. I stole the recipe from Karina. Her Cheese Sandwich bread. It uses the french bread mix from Gluten Free Pantry. I haven't baked yeast bread since I was a little girl. I have to say, making the gluten free version is way easier! No kneading. :) I also bought their sandwich bread mix. I, amazingly, found it at one of our chain grocery stores. It cost a ton, but I figured I could buy it there, try it out, and if I like it I can order online. I will be ordering online. It is so easy to make. I can throw a loaf together on a Sunday and have sandwiches during the week. Easy lunches once again! But back to the idea of cooking and food as emotional comfort. Yesterday I appeased a craving for Thai food. I arrived at the restaurant (my usual place until a month and a half ago) with a GF restaurant card I found at Gluten Free Travel. I showed him the card in both English and Thai (he was very happy to see the Thai version.) Very kindly he walk me through the menu pointing out which dishes he knew were safe. I then clarified that soy sauce was off limits (what is the chance they would actually have wheat free tamari?) and he pointed out a few dishes he thought I might like. Why was I craving my favorite take out? I received a call from one of my doctors. I went in for my annual checkup about two weeks ago and they had received my test results. Apparently they found abnormal cells in my pap smear (sorry guys, I know this is girlie talk). I have to go back in on Tuesday for some more tests. I know it could be nothing (lab mistake, irritation caused by meds, etc.) Or it could be something bad. I don't even want to start thinking of that end of the spectrum. It was quite a shock to receive that call, especially on the heels of all of my recent health issues/discoveries. I am ready for my health to stop pooping on me. Enough already. So I eat the foods I love. I go to The Spice House and buy more fragrant spices. Tonight I bake bread. Tomorrow I occupy myself with holiday cooking and family. Friday I entertain friends at my monthly movie night. We are having tacos: the anti-Thanksgiving meal. I surround myself with food and friends. (God, I should be 400 lbs with all this food!) I need to focus on all of the good things right now so I don't obsess over what this test could mean. I'm actually hoping it is somehow connected to the Celiac. Inflammation cause by CD. That would be good. Easily explained and connected to something I am already treating. Keep your fingers crossed for me. 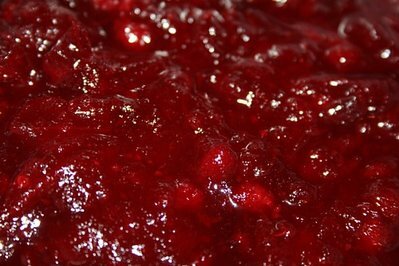 For now I am going to de-pan my bread, eat a bit of it, wash dishes, and make some cranberry sauce. I'll let you know how it turns out. Hello, my name is Shannon and I am a polenta addict. I admit it. Full disclosure. But really, how could you not love polenta with all its versatility? Light, rich peaks of creamy goodness. Solid, dense cubes fried up along side a savory dipping sauce. Day, evening, late night snack. Somewhere along the way polenta has become one of my comfort foods. I never ate it as a child, but something in the simple, heartiness of the dish calls to me. It makes me feel warmed from the inside-out. At times I forget about it. Polenta can be so unassuming, sitting along side beautiful veggies and seafood. It can be overlooked. I will go months without incorporating it into my menu. Then I rediscover it, and I start all over again. Polenta with pumpkin. Polenta with Parmesan. Polenta fries (leftovers from last night will make these treats). Polenta for breakfast? Hmm...well, if they eat grits for breakfast, why not polenta? So often my recipes are inspired by the ingredients I have available hidden in my cupboards and fridge. 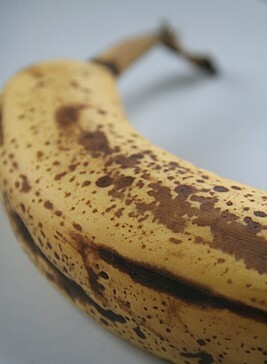 Last night I noticed that my two remaining bananas are getting speckled and brown. They are perfectly ready for cooking or baking. 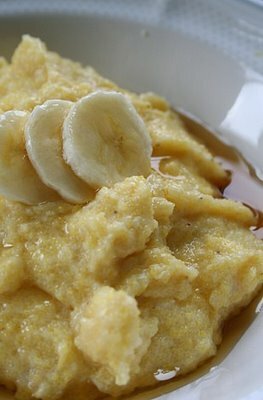 While the Banana Corn Cake recipe over on Karina's blog is calling to me, polenta has sunk it's claws into my taste buds. Could I possibly combine the bananas with the polenta? Yes siree Bob! In a medium pot, heat milk to nearly a boil. Slowly pour in polenta, whisking constantly. Add mashed banana and continue to whisk. When the polenta begins to thicken remove from heat. Mix in diced banana. Serve warm with as much or as little maple syrup as you like poured over the top. When you change your diet it takes time to adjust. Not just your body, but your way of thinking. You read labels, scour your cookbooks for suitable recipes (or ones you can modify), and experiment...alot. I love cooking. The kitchen is my laboratory. Spices, grains, proteins. I love to mix and match. Usually the dish turns out pretty good. I'll eat all the leftovers, but don't always write down the recipe. Other times something just does not work. The flavoring is off, the dish is over/under cooked. These attempts are quickly dumped and forgotten. Then there are the occasions where you strike just the right balance of flavor, texture, and that indefinable something that make a fantastic meal. You write those recipes down. You share them. You make them over and over. Yum! As I mentioned, I love to cook. Even more, I love to cook for other people. One of my favorite things to do is to host a dinner party or a potluck. Filling your home with friends and good food feeds the soul. I have done this only once since my diagnosis. The Ginger-Glazed Ham. I lucked out, managing to not overcook it and created a glaze that was delicious. (If I may say so myself.) Other than that I have not dined much with others. Partly, I am hesitant to put them through the run around of finding a restaurant that is sensitive to the needs of a gluten-free diet. I myself have barely begun to tackle that monster. 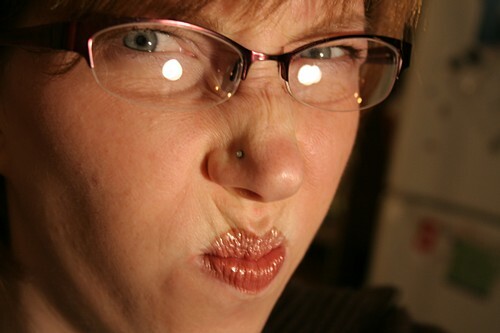 While I can appreciate the learning experience of a "failed" gluten-free meal experiment, a friend invited to dine with me may not. I am adventurous in my spicing and nontraditional food pairings. I have friends who are down right picky. Polenta? Asparagus? Pasta made from corn? Quin..what? They would be polite and supportive, but would choose not to partake in the meal. That is fine. Depending on the meal, I may not blame them. It has made me hesitate to invite other to dinner. And quite frankly, cooking is getting expensive, what with the organic, specialty, and not-on-sale products that happen to be gluten-free. If I am going to cook, I want to make sure it will be eaten. That being said, I cooked a meal for someone tonight. This was actually the first time I had ever cooked for him. Never mind the gluten-free part, first time ever. Slightly nerve wracking. He, being the great supportive guy he is, cooked dinner for me last week. 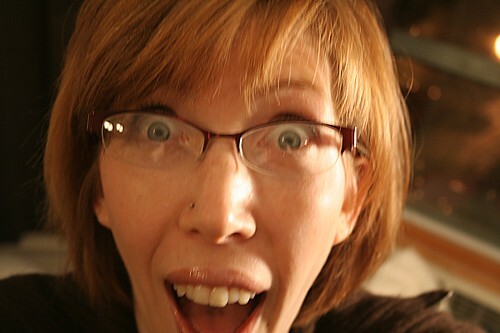 This is the same person that surprised me with a visit to the gluten-free cupcake place. Prior to cooking he went over the list of ingredients with me to assure there was not accidental glutening. I brought along the needed chicken broth (Pacific Organics since I had just purchased a case of it at Costco.) He prepared a very simple, yet tasty Roasted Chicken and Potatoes. Meat and potatoes. What a guy. :) Tonight's menu was a bit different: Parmesan Polenta along side Italian Sausage, Yellow Peppers, and Sweet Onion with Pesto. I need to come up with a shorter version of that name. Perhaps, wow-yum-polenta-goodness. I did not measure. That may be a problem when figuring out the recipe. I am going to have to estimate some of the ingredients, but that's ok. The verdict from the guy? "That was very good. You're a good cook, little girl." :) (ok, the "little girl" part was annoying, but he likes to tease me about being young.) The most rewarding part of this was that I made him a satisfying gluten-free meal and introduced him to the world of polenta at the same time. I have found an element that will increase my cooking for friends love, cooking for them and introducing them to new ingredients/recipes/food ideas all at the same time. The only problem with such good food? You eat so much you end up in a food coma. So, in the vein of sharing food ideas with friends, here is tonight's recipe. I hope you enjoy it as much as he did. As the peppers and onion are sauteing, bring chicken broth and milk to a boil in a medium sauce pot. Season with salt and pepper. Whisk the Parmesan into the pot. Slowly pour polenta into the pot, whisking constantly, until all polenta is incorporated. The mixture may be thin. DO NOT ADD EXTRA POLENTA. Continue whisking. Remove from heat when polenta begins to thicken and set. Serve a heaping scoop (or three) of polenta with the sausage mixture. Season with salt (if needed), and top with extra grated Parmesan. I have no picture just yet, but will post one as soon as I take one (when I eat some leftovers.) If anything seems unclear in the recipe directions please let me know. I am super sleepy and not sure if the directions are coherent. Now, usually I would not notice how poorly I am eating. I have never had to watch my diet until my Celiac diagnosis. This has certainly raised my level of awareness. Now it is even higher because I called and made an appointment with a dietitian. I know I am on the right track, but I want to make sure that I do this right. If I am going to have a healthy diet, I want to make sure it is truly healthy. Fiber, calcium, iron? I want to be sure I am getting it all. My appointment is in two weeks. I had decided to log all of the food that I eat between now and seeing the dietitian. (I figure it will put me one step ahead in the process here.) It is just weird how hyper aware you become of the snacking and munching you do. I am a grazer. Always have been. It is just strange to see a LONG list of food that you have consumed. I don't think I am heavy or eating too much. Far from it. I actually want to make sure I gain a few pounds back that I lost pre-diagnosis. I just want to do it in a healthy manner. Hence, the dietitian. After approximately two weeks of hunting and waiting and contemplating purchasing online, I found some Pamela's Pancake and Baking Mix. I had heard many wonderful things from Karina about it. Of course I wanted to use it right away. I had gone to The Spice House over the weekend (twice!) and picked up some fantastic spices. They have scads of recipes on their website that you can utilize your newly purchased spices in preparing. I had wanted to try cooking or baking with cardamom. 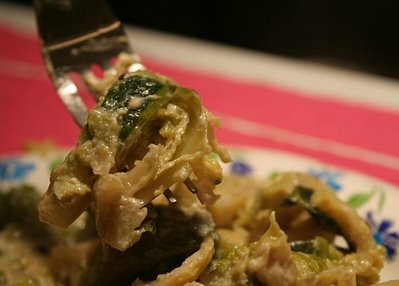 I came across this recipe and thought it looked very interesting. I figured it was so unique that, if it turned out different than a gluten filled version, I would never know the difference. Did it work? Oh...wow...yum! All I can say it that these rate a very tall glass of milk! Light, crispy, slightly sweet, subtly spicy. A must repeat! Slice into ¼-inch slices and place on an ungreased baking sheet. Bake in preheated 350 degree oven until golden brown, 12-14 minutes (closer to 12 minutes, they over cook quickly). 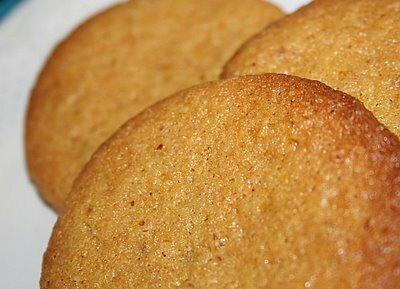 Let cookies cool for 2 minutes on baking sheet, then remove to a rack to cool thoroughly. Yields approximately 6 dozen cookies. They are very thin and crisp. I don't know if the thin-ness is due to the GF flour, not enough baking soda/powder, or if that is how they are supposed to turn out. Either way, yummy! And Pamela's? So far I am impressed. Now I am dying to try tons of holiday baking! Steep the loose leaf chai in the hot water for 5-7 minutes. Strain brewed tea into a small saucepan. Add quinoa and vanilla, bring to a boil. Cover and reduce to a simmer. 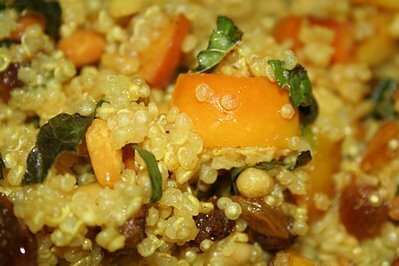 Simmer for 10 minutes or until quinoa is tender. Remove from heat. 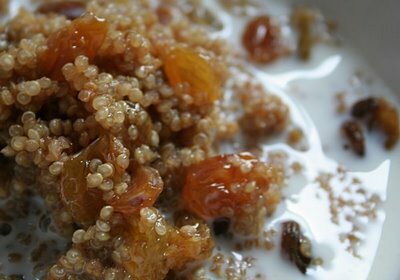 Fluff quinoa ans mix in raisins (as much or little as you prefer.) Cover and allow to sit for 3-5 minutes (raisins will soften and plump.) Serve with a light (or heavy) drizzle of honey, top with milk. Enjoy! I bet this would also be good topped with some toasted almond slivers or slices. I love the chai flavoring. I am going to play around with this and see how other spices (minus the tea) would work. Cardamon pods and star anise, perhaps? Today was a day of many pit stops. I embarked on a shopping trip that ended up including stops at four different stores. I have long been the type of person who buys her produce at a veggie market (you can't beat the prices!) and purchases the remaining food stuffs at the local Dominicks. Now I have to add a stop at Whole Foods (or Trader Joe's) for those more specialty type items. While a lengthy journey, it was a productive one. My first stop was at a local spice shop. I had never been there before, but had heard many good things. Man, was my aunt right when she raves about The Spice House! It was amazing. Pure spices, blends, you name it they have it. Upon telling the helpful employee I am gluten free she (after quickly conferring with the manager/owner?) informed me that the only item I could not eat is the taco seasoning. Woo hoo!!! A whole store full of amazing spices that I can eat. Of course, I had actually gone in there looking for taco seasoning. The girl was extremely helpful in suggesting an alternate blend for my planned tacos. I ended up leaving with Sweet Curry Powder, Thai Red Curry, Herbs de Provence, Pilsen Latino Seasoning, Hot Cocoa Mix, Mulling Spices, and Argyle Street Asian Blend. There was so much more that I wanted to pick up, but felt that was enough for now. It was great. 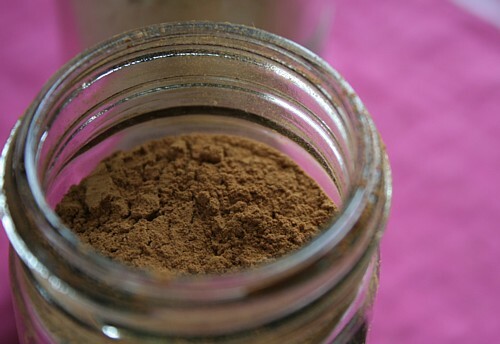 You can buy a shaker bottle full (usually about 2 oz) or you can buy a bag with 1, 4, 8, or 16oz of a spice. If you already have the shaker jar and just need a refill it costs $1 less. 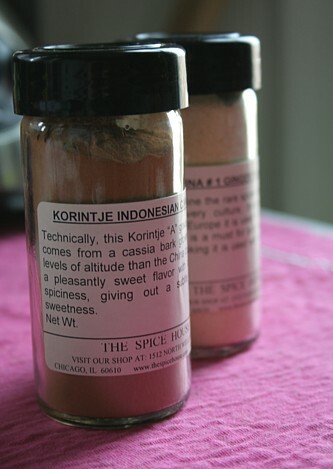 The best news (for all of you) is that you can order online and they will ship the spices to you. I can say firsthand that the two curries are excellent. The hot cocoa is ok. I prefer it stronger and sweeter. I think I need to start experimenting and make my own hot cocoa mix. Any suggestions? After all of that shopping (I was gone for nearly four hours!) I came home and started cooking. I was dying to bust into my spices. Yesterday I found a couple of recipes I wanted to try. Have you even been so full you felt ready to burst, but you just want to keep eating because it tastes so good? Yep, that's me. I made Thai-Spiced Winter Squash Soup and Curried Apple Quinoa. Both dishes are adaptations of recipes I found on the site 101 Cookbooks. I was beyond happy with the results. This was the first time I had used quinoa. The recipe actually called for couscous, but a substitution had to be made. This was exactly the right grain to use. It was lovely. So I give you two flavorful, aromatic dishes. Enjoy! In a large saucepan over medium-high heat add 4 tablespoons of the butter, the curry powder, and a couple generous pinches of salt, and cook for a minute or until the spices are fragrant. Stir in the chopped apples and raisins, and cook for about 3 minutes, enough time for the apples to soften up a bit and absorb some of the curry. Scoop the apples and raisins from the pan and set aside in a separate bowl. In the same pan, again over medium-high heat, add the remaining tablespoon of butter. Stir in the green onions, let them soften up a bit and then add the water, salt, and quinoa. Bring to a boil, then cover and simmer over low heat heat for 10-15 minutes. Remove from heat and use a fork to fluff up the quinoa. Stir in the apples, pine nuts, and chopped mint. Season with more salt and curry powder to taste. Preheat the oven to 375 degrees and place the oven racks in the middle. Carefully cut each squash/pumpkin into halves (or quarters). Slather each piece of squash with butter, sprinkle generously with salt, place on a baking sheet skin sides down, and place in the oven. Roast for about an hour or until the squash is tender throughout. When the pumpkin/squash are cool enough to handle scoop it into a large pot over medium high heat. Add the coconut milk and curry paste and bring to a simmer. Remove from the heat and puree in a blender, you should have a very thick base at this point. Slowly add chicken stock a cup at a time to the blender as it is running, until the soup is the consistency you prefer (a vegetable stock could work here as well). Bring up to a simmer again and add the salt (and more curry paste if you like). Garnish individual bowls with plain yogurt and a dash of nutmeg. I had never made squash soup before. I had never used Thai red curry paste. It was a new adventure. It actually turned out a bit too spicy for me. I used a good spice blend from The Spice House, so it may have been stronger than what you would find at your local supermarket. (Although, I could be wrong.) I needed to cut the heat and went looking for some sour cream. I did not have any, but figured the plain yogurt should be ok. Boy howdy! It was perfect! Yogurt and curry should have been the obvious pairing. It was exactly what was needed to complete the rich creamy soup. I have to admit it. I am in love. Tinkyada pasta and I are having a torrid love affair. Seriously! When I was first told I might have Celiac the very first thought that popped into my head was "NNNOOOOOOOOOOO!!! I can't give up pasta!" I truly despaired. I am the pasta queen. I will put anything on pasta. It is a staple in my diet. Tinkyada has guaranteed that it will remain so. A couple days ago I made a quick easy pasta dish. 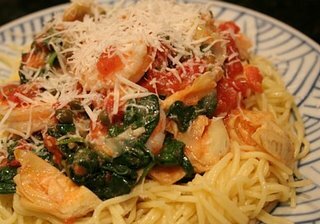 I cooked up some gf pasta. Once it was done and drained I threw in frozen artichokes, cherry tomatoes (halved), pine nuts, and goat cheese. I tossed it with a generous helping of EVOO, balsamic vinegar, and kosher salt. So simple and so good. The best part? It is goo hot and cold. Great contrasting flavors: sweet tomatoes, tangy cheese and vinegar. Yum! Did I mention I bought a blender? I love using it. Smoothies, baby! Frozen mango is the best ingredient ever. Not only is it mango (the fruit of heaven), but it adds the slushiness a smoothie needs. After a quick trip to the grocery store tomorrow I plan to make some Thai Coconut Squash Soup. The blender will be put to use for that. I found the recipe at a newly discovered site: 101 Cookbooks. I looks so good. Speaking of cookbooks, I have a severe addiction. I see a cookbook and I am overcome with the compulsion to buy it. I can't wait to get the Gluten Free Dessert Cookbook that Mike (of Gluten-Free-Blog) has written. (I saw the pic of Lynn with her copy of the book. I am uber jealous!!!!) To stave off the craving for the book (which I need for holiday baking!) I bought a book tonight. I already own The Best Recipe (America's Test Kitchen/Cooks Illustrated). It is fantastic. Unfortunately, a friend borrowed it and I have not seen it in over a year. I bought their new book America's Test Kitchen Family Cookbook. It is in a 3-ring binder, reminiscent of the old Betty Crocker (I think). Beautiful photos, great basic recipes. So many things we can eat and many more that are begging to be modified. The thing that I love about their books is that each recipe has been tweaked and tested 20-50 times before it makes it into a book. These are truly the best version. I think we should all start harassing them to publish a gluten free book. It would be fantastic! My mom and I are trying to plan out the menu for Thanksgiving. This will be our first gluten free turkey day. To make it more of a challenge my brother is a vegetarian. There will be (at most) six people in attendance. At this point mom is planning on making a stuffed turkey for her and dad, turkey breast with gf stuffing for me, and a fake turkey for my brother. Insane! She just refuses to cook the full turkey without stuffing it. I think it is a needless amount of extra cooking, but it is her decision. The thing we are stuck on right now is what to do about a stuffing/dressing for my turkey. Does anyone have a gf stuffing recipe? Any ideas for a substitution for condensed cream of mushroom soup? (The really sad part of all of this is that I finally worked along side Mom last year to learn how to make all our traditional T-Day dishes. Now I can't eat a bunch of them.) New traditions. That's what we need. I was out at my parents house this weekend. I love them. They are so supportive about my new diet. Dad keeps picking up different kinds of flours and other GF items at the store. Apparently he tries making french bread the other day. He just tried to use his standard recipe and substituted Bob's Red Mill All-Purpose Baking Mix for the flour. He said the dough was like cement. See, this is what happens when you don't do your research. :) I love him, but he never follows a recipe. While this can work with cooking, baking is too precise for his style of winging it. Anyhow, this weekend Mom and I headed to Costco where I bought WAY too much stuff. I am now stocked up on frozen chicken tenders, shrimp, frozen berries, a blender (woo hoo! ), GF chicken stock and tomato soup, and so much more. I even picked up a copy of The Lake House. I adore this movie. When we returned it was time to make some dinner. Usually, when I am at home, I plan out my meals ahead of time. I have purchased ingredients specifically for a set menu. Cooking at my parents' house is an adventure. Last time I made a stir fry, but it didn't turn out as I had hoped (no GF soy sauce to be had.) This time I was far more successful. In a large skillet, heat olive oil over med-high heat. Toss in garlic, saute briefly (don't let it turn brown!) Add tomatoes, artichokes, and capers. Saute until juices reduce. Add spinach. When it begins to wilt add shrimp and heat through. Season with salt and pepper to taste. Serve over pasta and top with cheese. My parents did not have any Tinkyada pasta. Sadness. Instead they had a package of corn pasta (I can't remember the name right now.) The taste was fine. The texture was ok. The longer it was out of the water the softer it got. You would need to make it very al dente. It was decent, though. If I had not already tried Tinkyada I would probably have liked it better. Today I decided to put all of the GF flours in my parents' pantry to use. This was my first foray into GF baking. And? Success!!! So good. I have to send huge thanks to Karina at Gluten Free Goddess (who truly is a goddess). 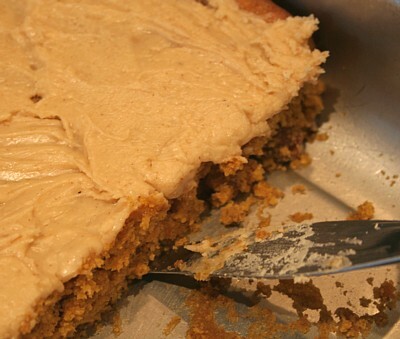 I used her recipe for Pumpkin Bars. We did not have Pamela's Baking Mix, so I followed her directions so that I could use the Bob's Red Mill All-Purpose Flour mix (with additional xantham gun, baking powder, and baking soda.) The bars, themselves, are great. The frosting is to die for. Yum! I love spices, especially cinnamon and nutmeg (the two in the frosting.) As I'm typing this I am craving another piece. I think I need to cut myself another slice. Must assuage my sweet tooth craving! This past week has been very interesting. Both good and bad. Work was beyond stressful. Grades were due. For any of you who are not teachers, this is the worst time of the school year. As the music teacher I have to calculate grades for over 600 students. That's a whole lot of grades! I turned them all in yesterday. They are done. Woo hoo!!!!! Well, done until the end of second quarter. Unfortunately, all of that stress and work meant that cooking was the last thing on my mind. Who has the time or energy to prepare a meal from scratch when you have so much work to do? As a result I tried out a few new products. I had purchased GF muffins from Whole Foods a couple weeks ago and was not pleased. Weird texture. Eh? So this week as I opened the loaf of GF bread I had bought at Trader Joe's I did not have much hope. I had read that most store bought GF bread is better when toasted. I have to admit that I did not own a toaster. I remedied that on Monday. Being my father's daughter I could not buy just any toaster, it had to have the cool gadget factor. I did a little research and shopped around. In the end I purchased Back to Basics Toaster and Egg Poacher. 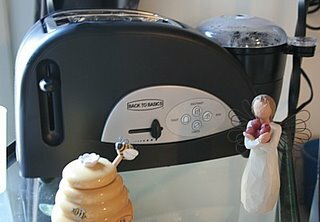 Coolest toaster ever! If you have never heard of this machine, it can cook an egg, heat up breakfast sausage, and toast bread at the same time. AND it all finishes at the same time! It actually works. I took it out of the box, ran it a few times to get rid of the plastic/chemical smell, and loaded it up. My late night feast included Food for Life Brown Rice bread and Polaner black raspberry preserves. Yum! This bread is great! The preserves even say gluten free on the label. I was so pleased. The next morning I tried out the egg cooker. Worked like a charm. This was the best purchase ever. Also, It looks so great sitting on my shelf along with the Angel of Good Health that my mom bought me after I was diagnosed. Today I am off to by huge quantities of everything. Mom and I are going to Costco. Brown rice, frozen shrimp, frozen chicken tenders... all of those staples that I would rather not have to keep running to the store to purchase. I have gone through more rice in the past three weeks than in the past year. Wow, three weeks. I didn't realize it had been that long already. I feel as though I just started. By the time I hit three years I will feel as though I have been doing this forever. Let's hope it is all second nature to me by then.